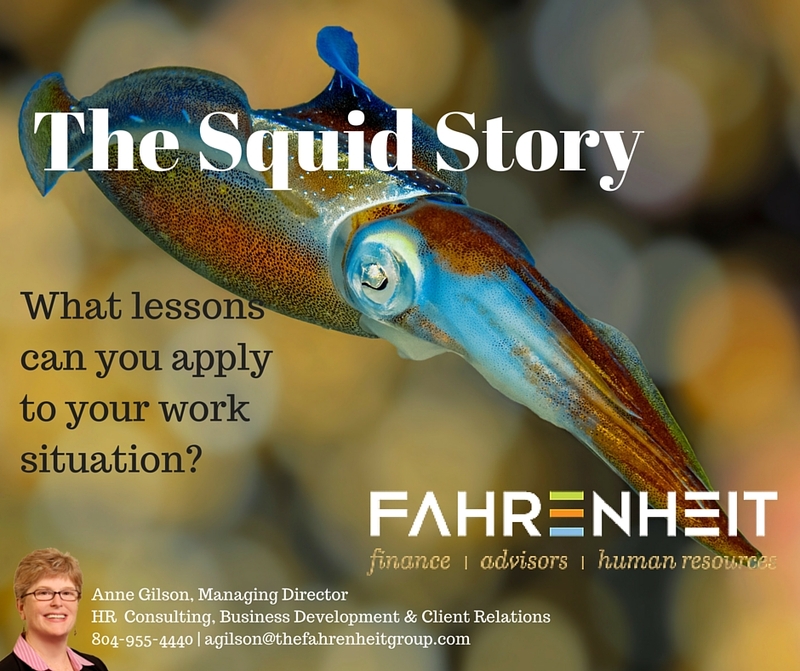 The Squid Story: What Lessons Can you Apply to your Work Situation? There are several leadership lessons we can learn from nature–here is one. As a scuba diver, I have enjoyed the beauty of the oceans, coral reefs, and amazing plant and sea life for years. The peaceful sounds of the water and the warm sun help rejuvenate me during time away from work. However, sometimes my mind can’t help me relate my experience in the ocean with events I see in organizations. It was April, the island was Curacao (35 miles north of Venezuela, in the Dutch Antilles). I was 30 feet underwater on a white, sandy bottom. A school of squid were 60 feet away. I wanted to get closer. The rest of the divers were occupied, so I was somewhat by myself. Slowly, I began to move towards the school of squid. Very carefully, without any quick motions, I made my way toward them. Unfortunately, no matter how slow I moved, the squid moved away from me. My air tank allowed for almost an hour of dive time, and despite my best efforts, I could not get any closer to the squid. I had to take my pride and my almost empty air tank back to the boat. The dive master had apparently watched me and my attempts to get closer to the squid. He suggested that maybe I should “give a little” the next time I saw the squid. He shared that if I was willing to move backwards instead of directly forwards, the squid might be willing to do the same. It was an interesting approach. The next day I chose to return to the same dive spot, and there were the squid. I was excited to try out the dive master’s idea. Again, 30 feet underwater, bright blue skies above, white sand below, and six squid about 75 feet from me. I moved about 10 feet towards the squid, and the squid moved back. Then I applied my new learning, the suggestion from the dive master, and moved about 5 feet away from the squid…and much to my amazement, the squid came closer to me! I was thrilled. I would have never anticipated that moving away would encourage the squid to come nearer to me, but that is what occurred. So, I moved towards the squid, they moved back. I moved back, they came forward. We did this “dance” for several minutes and then I found myself within 10 feet of the six squid. Then it was five feet and then three. I wasn’t sure I wanted to get any closer, so I paused and watched. I was able to see the long tapered bodies, the short arms, the tentacles, and the fins on each side. I look at them, and they looked at me. What an experience. What a lesson in life; a lesson for the world of work. What a lesson for leaders. I believe that when I move away (give some space one might say), people move closer–closing a gap perhaps. A gap of communication, performance, or perceived effort. I learned that I don’t have to chase the future–it comes toward me at its own pace. I learned that I don’t always need to be the one to make things happen. How often do we, as leaders, feel our job is to move forward, and yet we can learn from nature that we may gain more ground by moving a little backwards. What lessons can you apply to your work situation? Are you willing to give a little? Try it. Observe the results. Try it again, hone your new skill of give and take. Please let me know how it worked for you. I can be reached at AGilson@fahrenheitadvisors.com. Check out our website at: www.fahrenheitadvisors.com.